Scabies is a contagious skin infection caused by a mite – Sarcoptes scabiei. The mite is not directly visible and burrows under the skin of the host. The area where the mite has burrowed itches very intensely and the itchiness may become even more sever during the night. Since it is contagious, it spreads very easily, especially to the members of the family, classrooms, nursing homes and child care centers. For this reason, doctors recommend that the scabies causes must be found and the entire contact group or family should get treatment for scabies. Scabies causes can be attributed to the mite – Sarcoptes scabiei, which is an eigh-legged mite and infection starts when the female mite lays eggs in the burrow created on the skin. A few days later, the larvae come out of the eggs and molt to form nymphs. The nymphs grow into adults who live for 4 weeks and lay eggs during this time. Intense itching is caused by the burrowing and movement of the mites due to a type of allergic reaction to mite proteins. Please note that scabies is contagious and is transferred by skin-to-skin contact with the person having scabies. It can also happen by sharing towels, clothes and bedding; however, this is not very common mode of transmission. Scabies mites survive only for 2-3 days away from the skin. A person who is exposed to scabies for the first time may exhibit symptoms 4 to 6 weeks after the initial infestation whereas someone who has previously had scabies will show the symptoms in a few days. However, please mind that there is a slight difference for children and adults in the places where infection occurs. Babies or young children may have the infection on the upper body – head, neck and shoulders. Adults can get rashes on the hands, wrists, abdomen and genital region. 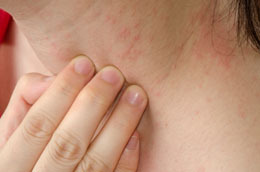 Scabies has signs and symptoms which are similar to dermatitis and eczema, such as itching and rashes on the skin. Visiting a doctor and getting the symptoms checked and confirmed is advised if you develop signs and symptoms indicative of scabies. Through learning the scabies causes and symptoms, you can get a better understanding of this condition. Some measures can be taken at home for a patient suffering from scabies. All the patient’s clothes – under garments, towels etc. should be washed in hot water. In case any clothes cannot be washed or dry-cleaned, they should be kept away from body contact for more than 72 hours. Upholstery and carpets should be thoroughly vacuumed. A cool bath eases itching and applying calamine lotion to the lesions is also helpful. For severe itching, take an antihistamine prescribed by the doctor. Neem oil is known as an effective and natural cure for skin ailments. It kills the mites causing scabies, cures bacterial infection in the skin, soothes the rashes and reduces the inflammation. Another natural home remedy for scabies is to consume bitter gourd juice. Bitter as it tastes, it is effective for skin ailments. Taking this juice in small sips for around 7 days helps to prevent and cure scabies. Tea tree oil is very effective as it helps in getting rid of the itchiness, and killing the mites and their eggs under the skin. As tea tree has different effects on different people, it may take some time to see its effects. The most effective way is to mix tea tree oil in bathing water. If you still experience itching after 6 weeks of treatment, you should approach your doctor for a reassessment and new treatment options as it might indicate that the treatment has been ineffective. It is very important to maintain cleanliness in the house to ensure that there is no recurrence of scabies infection as the mite can live for 1-2 days off the body. All the parts of the house which have come in contact with the person suffering from scabies should be cleaned thoroughly, such as rugs, carpets and mattresses etc. Floors and bathrooms should be disinfected thoroughly by mopping. After each clean, it is recommended to bleach the mop. Pine cleaner or tea tree oil can be used to clean the mattresses. Please mind that furnace filters should be changed weekly. Please strip the beds with disposable gloves on. The bedding and towels should be washed and dried under hot sun or in hot dryer everyday till the rashes are completely gone. If a thick comforter is used, it is best to dry clean it or discard it, since water may not clean all the layers. The blankets should be placed in the dryer every night before bed. Wash all clothes every day and bag them as soon as they are removed. Vinegar or oxy should be added to every load of clothes. Vacuum bags can be used for storing or quarantining clothes which cannot be washed or dry cleaned. These bags can be placed in the freezer for 24 hours or kept in airtight bag for one week. Items like stuffed toys, hair & tooth brushes, footwear, jackets & coats, gloves, hats and robes should also be treated in the same manner. Can Local Honey for Allergies Help?